Need a charge? We've got you covered. Right now, Deadspin readers can save up to 72% on these top portable power banks and charging accessories. If you want the most bang for your buck, check out the Power Vault. 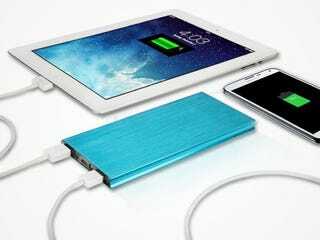 It's super-slim and portable, has two USB charging ports, and packs 18,000mAh of power so you can stay charged on the road. BatteryBox packs more power than any other product of it's kind - you can power a Macbook up to 13 hours and charge your iPhone up to 11 times without the need for an outlet. It's also better for your device's internal batteries than standard power banks, and maintains full capacity for up to 5 years. Not only does ZeroLemon recharge your phone more than 7 times over, it's also water resistant, shock proof, and can charge via solar power. It comes with a 180 day manufacturer warranty, and Deadspin readers can pick one up for 50% off + free US shipping. The ZeroShock iPhone 6/6 Plus case protects your iPhone from drops and scratches, and also gives you an extra 250% battery life. Grab yours for 24% off below.